The Resident is a Hammer horror film starring Christopher Lee. So really it should have had me at hello. Until, well, it started. Double Oscar winner Hilary Swank (what was she thinking?) plays ER doctor Juliet Devereux, who moves into a beautiful, huge and suspiciously cheap flat in Brooklyn at the behest of the suspiciously friendly landlord, Max. Okay, so Juliet tries. Suspecting something funny may be going on, she installs CCTV in her flat… but fails to check the footage. Discovering an empty syringe cap on her bedroom floor, she orders herself a blood test (but doesn't check her CCTV)… but, on finding her system sluggish with Valium, she still returns to the flat. Finding psycho Max in her flat, she phones… her dead boyfriend. Is this low-rent Single White Female supposed to make us feel scared? Cuz all it makes me feel is the need for a glass of wine – no Valium required. 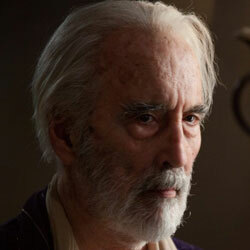 As for Christopher Lee, well, clearly he's only there to lure mugs like me into the cinema. True, he adds some much needed class to the proceedings, but he only has about six lines, and frankly he looks so ancient that it seems inhumane to ask him to do more.